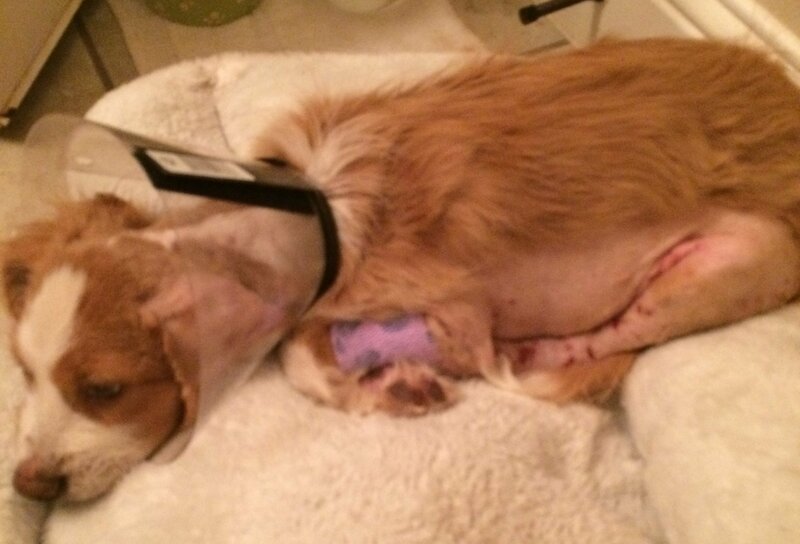 Recently a woman was out walking and happened upon a young puppy being viciously attacked by eight other dogs who were biting him and pulling him from multiple directions. The rescuer was able to run the other dogs off and rush the puppy, who we’ve named Rocky, to a local animal emergency clinic. 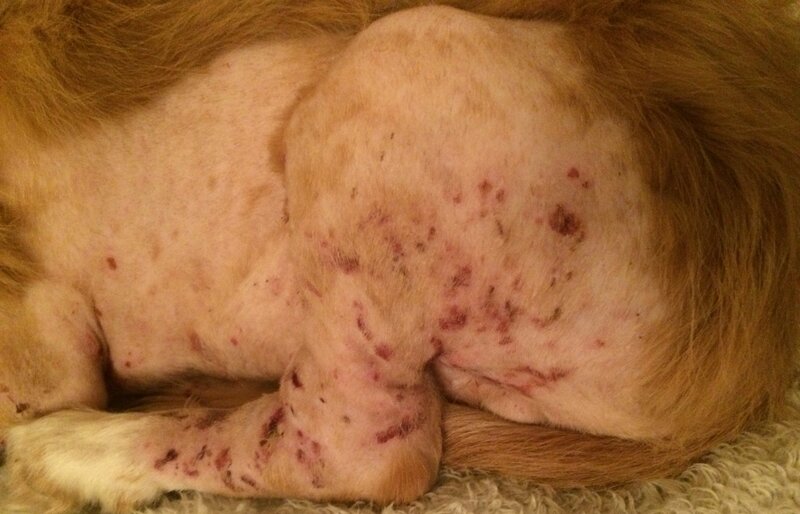 Rocky was covered in puncture wounds on all four extremities, head, neck, ears and belly. 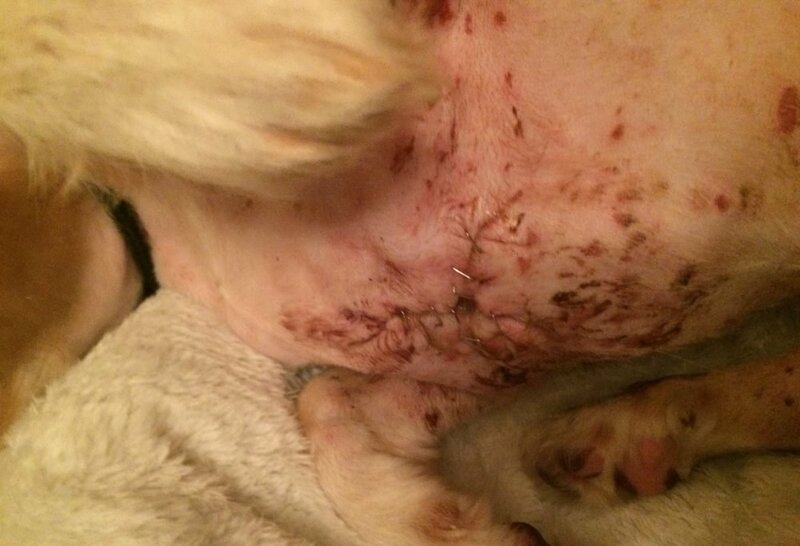 He had a large open wound on his belly requiring 20+ staples to close. Because the trauma of the open wounds caused infection and significant anemia, the puppy is still in the hospital on IV fluids and antibiotics. Our vet feels Rocky will recover from this ordeal but since he is still a baby he needs extra time for the large belly wound to heal and for the antibiotics to do their job. Sweet Rocky will need to stay in the animal hospital for a bit longer! BRIT has stepped up to help this approximately four-month old Brittany blend with his hospital bills and to find a special foster family with the ability to nurse him through his recovery. Once healed, BRIT will find Rocky a safe and loving forever home. To-date Rocky has racked up over $1,000 in medical bills (through no fault of his own!) As you know adoption fees don’t cover these types of emergency expenses so we are turning to YOU our BRIT Super Hero’s to ask for donations to help cover Rocky’s vet bills. “Hi everybody, my name is Rocky. I was named that because I’m a brave fighter. When I was found my entire chest was ripped wide open by a bunch of attack dogs and the ER vet wanted to “put me down” and thought “I wouldn’t make it” but I proved to be a brave little fighter and look at me now! My bite wounds on my legs have healed and the big bite wound on my chest is starting to heal up nicely but still needs care. As you can see from my photos the stitches have stopped draining and are looking good too. My friends at the hospital bought me this snazzy t-shirt so I won’t be tempted to mess with my stitches. Yesterday we transferred Rocky from West Texas to our primary vet, Dr. Saliba, in Granbury. He is healing but very slowly. Several of the puncture wounds are still infected and full of puss; unfortunately, he is experiencing drainage problems. Dr. Saliba has put him on high-powered antibiotics to fight the infection and her staff is giving him daily hydrotherapy to keep his wounds clean. We’re keeping our fingers crossed that he will make it through this critical time and ask for your continued prayers and financial support. So far we have raised enough money to cover the West Texas emergency hospital bills, but need to raise more to cover his ongoing medical care. This little boy is a real trooper! He’s been through two surgeries, neutered, wound hydrotherapy (3 times a day for a week), dew claw removal (all four…they were a mess), not to mention being mauled by eight mean dogs! The good news is his bite marks are healing nicely, his big chest wound which was full of debris and infection is finally healing after yesterday’s surgery, and his spirits are lifting.